Most infectious disease results from cumulative environmental and/or nutritional insults. 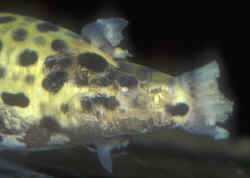 Here, a puffer is suffering from "fungal" (mostly bacterial) infection. Re: Kole Tang sick? Happy New Year Bob, I wasn't going to continue with this( I figured I must be asking many silly questions) however, I took the advise of my LFS and treated the Kole tang/clown fish with Organic Cure in a separate 10 gallon tank. Unfortunately, yesterday morning the tang passed away. <My friend... please use the Google Search feature on WWM and read of not just my opinions re this product, but the results of others use... Irrespective of the name, "Organi-cure" is a biocide...> I immediately tested the water and found Amm 0, Nitrites 0(didn't test for Nitrates). Was that a reaction to the medication? <What? Not testing for nitrates? The loss? Likely a major contributing cause> I forgot to mention in my previous e-mail that my maroon clown fish was the first fish that developed it even though I have never seen it scratching and has been eating fine). This is the second Kole tang that I lost. Also, I have a 3 1/2 undulated trigger possibly from the Pacific that I temporarily placed him in the main tank and has been behaving ok so far( has neither attacked nor bothered my yellow tang or any of my polyps/hard corals). Would it be too risky to leave him there with the tang and possibly the clown fish? <Too risky? Define your terms... or ask who gave you the sterling advice re the "medication"> This is a gorgeous fish that I would like to keep, nevertheless, I think I would have to turn my tank into a non-reef environment(?) <Perhaps, ultimately... but it does hail from reefs...> At last, my LFS does not recommend to treat the entire 55 gallon tank, but instead to treat the fish (i.e. clown fish) individually. I believe treating the entire tank for ick would necessitate to remove all inverts etc. into another tank, right? Btw, I am a diver too, and I find diving less stressful than fish keeping. <You are an intelligent person who can/will work into "less stress" by way of exposure... re the illness that is your problems in the tank, I have referred you before to the sections on WetWebMedia.com to review. Bob Fenner> Thank you for your attention, D.
Question: Does Ich / Black Worms pose a problem to my corals and invertebrates. I am going to take the infected fish out but want to know if I should worry about my corals and mainly my clams..
Bob's Answer: Jamie, do you mean Ich (as in the marine protozoan Cryptocaryon) from feeding black worms? Not to worry, mate. As far as I know such an introduction twixt these environments has not been recorded. OTOH, brine shrimp (Artemia) used live and even reconstituted from cysts have been implicated in marine ich infestations... here a freshwater bath protocol before feeding is called for. For those freshwater (and sewage) Polychaetes there is no danger. Just don't overfeed. Question: I work at a fish store and do aquarium maintenance on the side. I have recently (in the past few months) come across a rather interesting (yet very bothersome) phenomenon. The first is with wrasses, especially with those of the genus Anampses and Coris. What happens is that within a week or two of getting the wrasses in, their lips appear to roll back exposing their teeth, the refuse to eat (or eat very little) and die within the same week. Are you familiar with this condition and do you know how to treat it? My other question is that I have seen (for no apparent reason, water quality checks out on all counts) black spots develop on a tang the size of Oodinium dots. Fresh water baths help to remove the ones off the fish, but when the fish is put back into the tank it is totally covered again within a couple of days. In advanced cases the fishes skin appears as though it dehydrated and wrinkled and is about to fall off. It seems to only affect tangs. Do you know what it is, why it starts up, and how to treat for it in a reef type environment? I would appreciate any help you can give me on this matter. My reputation as a professional is at stake here. I am having great difficulty at locating any information on these two conditions. Thank you for any help you can offer. Bob's Answer: Rob, the prognathal genera of wrasses you mention are dying as a consequence of being shipped for too long in too small a bag from the source or your supplier... very common with Anampses and Coris spp. They need to be put in large enough bags to easily turn around and either have fine sand shipped with them or the bags laid on their side so the animal can't rub its face in the corner. On arrival such animals should be quarantined and treated topically and/or via antibiotics (orally if they're eating). The black spots are a not so free living turbellarian flatworm of the genus Paravortex. A simple freshwater dip/bath will eliminate them BEFORE being placed in the main display tank... once the critters are established, biological cleaners may keep them in check otherwise. Question: Bob, my wife and I have an adolescent Imperator who is suffering lesions induced from poor water quality. We were using a source which contained some metals for about 6 months. We've since switched to a cleaner source and have been using in for the past three to four months. However, over the time we were using the poor water our Imperator developed some severe lesions on and around is facial area. What is the best treatment to help him heal these wounds? We are currently using vitamin supplements with feeding. Also, he has stopped scratching completely since the change to the cleaner water.